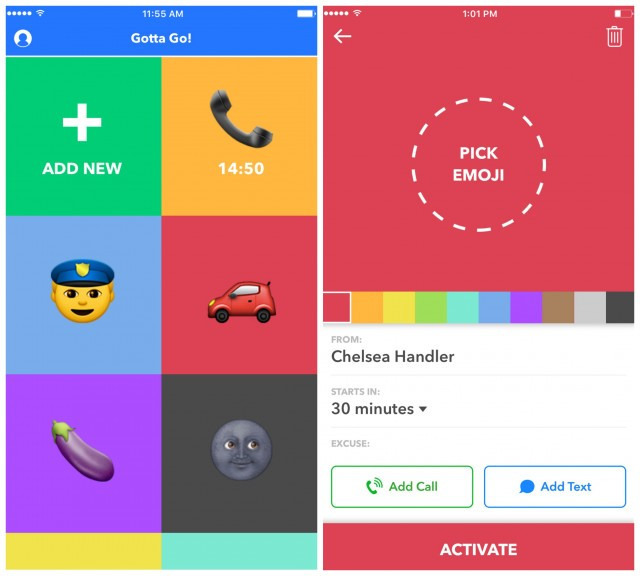 Gotta Go, lets you set up a fake phone call or text message that can provide you with an excuse that you, umm, gotta go. It’s perfect if you need to be saved from a monotonous meeting, dreadful date, or tortuous tinder date. Comedian, actress, author, television host, and producer Chelsea Handler is known for making people laugh. With Gotta Go, she’s made your excuses more believable when you’re trying to get out of uncomfortable conversation. How does the excuse to leave generator work? The app is simple, sleek and smart. It sends you real SMS messages and places a real phone call as part of the game plan. You’re even greeted with a pre-recorded message from Handler with instructions to help you cut out. Each of the preset excuses is customizable, from who “sent” the message, to what it says, the timing of the message, and timing of follow-up calls or messages. And you can create your own, too. Handler has been working with development company, Yeti, to design and build the app. She’s also friendly with Yeti president and founding partner Tony Scherba. Together they brought a pitch deck to Silicon Valley to convince investors to make an investment. They met with Foundation Capital, a well-known venture capital firm in San Francisco that has previously invested in Netflix, online lender LendingClub, and solar company Sunrun, among others. The whole process, complete with VC pitch is documented in the second episode of Handler’s new documentary, Chelsea Does, on Netflix, which explores marriage, race, the tech industry, and drug use. The VC firm ended up helping her producers pick out filming locations around Silicon Valley and organizing a mixer so Handler could mingle with members of the tech industry. Chelsea did bring a dog and eight-year-old boy to the meeting. But of course. Give Gotta Go a go. Actually, pressing one of the big, preset squares in the app is far quicker than typing out an actual message. There’s no fake excuse for a dead battery. Companies like Veloxity offer a suite of cell phone charging solutions to help retailers, organizations and events keep customers and their apps fully charged. Our charging stations are secure and can charge up to 8 phones with one kiosk.